Arianespace’s Vega success with PRISMA in numbers: 3 + 14 + 308 = 600! The Ariane 5 with its ATV Edoardo Amaldi payload is shown at the Spaceport’s ELA-3 launch zone, ready for liftoff on Arianespace’s third resupply flight to support the International Space Station. Arianespace’s third resupply mission for the International Space Station has entered its final countdown phase for a March 23 early morning Ariane 5 liftoff with Europe’s third Automated Transfer Vehicle (ATV). 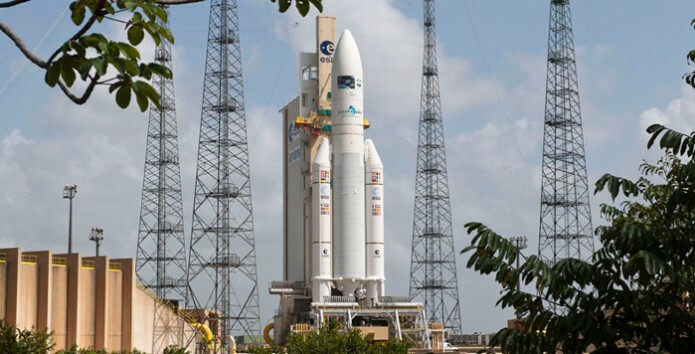 Using the Ariane 5 ES version of Arianespace’s heavy-lift workhorse, this flight will deploy the ATV into a 260-kilometer orbit – positioning the payload for its docking with the International Space Station. The mission has a total lift performance of over 20,000 kg., which includes the ATV’s mass of more than 19,700 kg. – representing the heaviest payload ever to be orbited by Ariane 5. Its payload is named after Italian physicist and spaceflight pioneer Edoardo Amaldi, and carries 6.6 metric tons of cargo for the International Space Station – including experiments, food, clothing, tools and spare parts, along with propellant for the multi-national crewed orbital facility. Ariane 5’s liftoff from the Spaceport is set at 1:34 a.m. local time in French Guiana, with the precise timing required for the ATV’s orbital positioning to dock with the International Space Station. Sign up for regular e-mail updates on Arianespace’s latest activities, including missions with the Ariane 5, Soyuz and Vega launchers.